Details relating to the German Commemorative of 2016. Mint Mark : A,D,F,G,J – depending on where the coin was minted. This is the 11th coin in the German series of the different provinces in the country. The honoured province this year is Sachsen. The Zwinger Palace in Dresden was chosen to represent Sachsen. This is a large complex of buildings and gardens, the construction of which commenced in 1709. The name “Zwinger” was used in the Middle Ages to refer to a defensive arrangement between the inner and outer walls. The Zwinger Palace is regarded as an important example of baroque architecture. To-day the Zwinger incorporates an art gallery of the old masters, a mathematics salon and a porcelain collection. In the inner circle we are shown the inner courtyard, looking at the Kronentor. At the top of the onion shaped tower four eagles bear a representation of the royal polish crown. To the left and right of the entrance are two statues in alcoves. The one on the left is the Roman goddess Ceres. She was the goddess of agriculture, fertility and marriage and represents summer. The statue on the right is the Roman god Pomona. He was the god of fruit and represents autumn. At the bottom is the country symbol “D” for Germany and the name of the province SACHSEN. Towards the top is the year of issue and at one o’clock the mint sign followed by the initial JT of the designer. 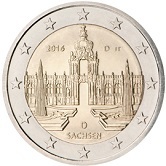 Return from German Commemorative 2016 to euro coin collector.